This dish is great with grilled fish or meat and quite a filler! Eat it up with pasta if you have made too much! until soft. Cut Peppers, squash, Chilli. 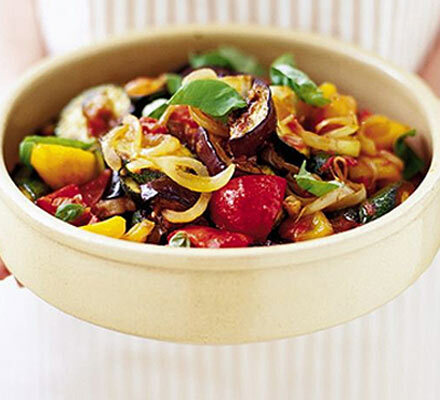 In a baking dish, make layers of fried onions, peppers, Aubergine, tomato puree, tinned toms and spices, salt and pepper. Layer the same again and top with tomatoes and wine. Cover and cook in 200 cent. oven for 50 mins. take out half way through and mix well so all is cooked. Serve with Meat and pasta. Yum!! !